Government of Punjab has announced 23 latest Government Jobs in University of Veterinary and Animal Sciences Lahore. Job Categories are as Follows, Assistant Professor (BPS-19) 09 Posts, Director ORIC (BPS-20) 01 post, Controller of Examination (BPS-19) 01 Post, Medical Officers (BPS-17) 02 Posts, Assistant Hostel Warden (BPS-16) 01 Posts, Curator (BPS-16) 01 Post, Veterinary Assistant (BPS-09) 01 Post, Junior Lab Assistant (BPS-05) 01 Post, Poultry Attendant (BPS-01) 02 Posts, Sweeper (BPS-01) 01 Post, Naib Qasid (BPS-01) 01 Post, Driver (BPS-04) 01 Post, Tractor Driver (BPS-04) 01 Post. Interested Candidates who have required Qualification and Experience may apply for these latest government Jobs to make their future safe and bright. 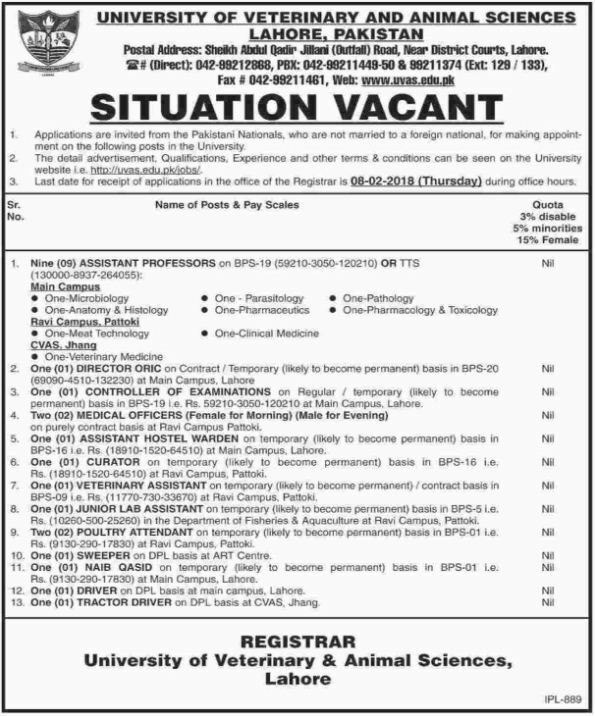 University of Veterinary and Animal Sciences 23 Jobs, 22 January 2018.